Dallying In The Dirt, Issue #195 --- The frost crept in and the Colocasia crashed. It finally happened this week. The first frost crept in overnight and left its mark on my most tender plants. We called it a Begonia frost but not a Geranium frost. It’s always amazing to me how much difference there is in the sensitivity to frost among the many tender plants that I grow. The Colocasia, which we know are a real tropical plant, collapse the moment the thermometer drops below 0 C. That means a day of digging their tubers out of the ground, cutting back the frosted leaves and setting the trimmed tubers in some warm spot to dry them out. There is a tray of them in the solarium. 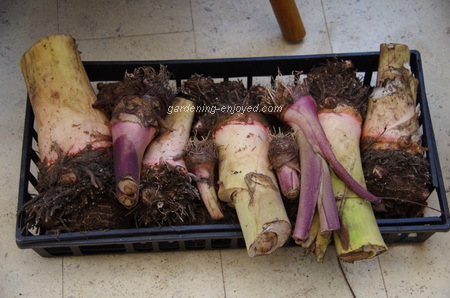 Each year some of those tubers get bigger and they also produce new small tubers making my collection grow. Why do I keep so many? Where and how will I find the room to start them next spring? We’ll leave those questions until March. The Geraniums and other tougher annual flowers and vegetables will carry on for a few more days. The amazing bright red Calibrachoa continue in full bloom while almost everything else is slowing down and fading. The frost is always welcome in the Veggie garden, where it starts the Leeks and Brussels Sprouts on their path to developing a wonderful sweeter flavour. The path through the back yard winds its way around a wonderful shrub. 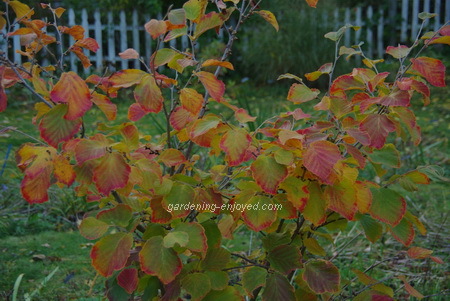 The Witch Hazel “Diane” Hamamelis x intermedia is about 2 M tall and 1 M wide. It starts the garden season with its rich red flowers in early March; it makes a nice visual block all summer, forcing visitors to walk around it to see the rest of the garden and then in the autumn it puts on a spectacular show of orange - red foliage that lasts for a few weeks. I prune one side of it because I planted it too close to the path but that gives it an interesting linear plane on its eastern side while the rest of it develops into a well behaved shrub / small tree that provides year round interest. Every garden should have one. There are a few varieties with different flower colours and a different species with yellow flowers that appear in the fall. Despite our crazy schedule this fall, I did manage to do something on time. The multi coloured Rex Begonias that brightened the western walkway were looking very sad after the frost but I had remembered to bring one of each variety into the house a few weeks before. Their tolerance of deep shade, makes them great houseplants. I want more than one. I need several of each type to plant outside again next spring. 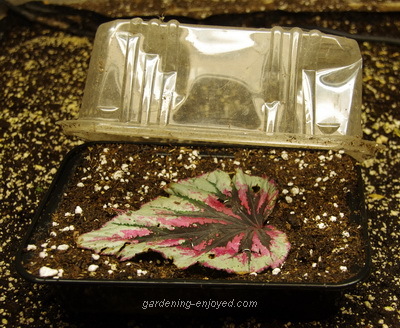 This week I spent some time making leaf cuttings of each variety. They have little or no stem to make cuttings from but they do have the ability to produce new little plantlets from parts of their leaves. I have tried a couple of different techniques and will do some more when I see which method seems to be working the best. It’s an easy and fascinating process and it’s very rewarding when you see those little plantlets start to develop. For those of you following the story. I was down to see little Matty last night and she is coming along very nicely although the hospital will continue to be her home for some time yet. Her mother, otherwise known as my daughter, spends her non-hospital hours living in our local version of Ronald McDonald House which is just an incredible facility and if you are ever wondering where to send your charitable dollars, it should be on your list. Elizabeth Asks? I enjoy your newsletter and use quite a few "hints" from you answering the questions about gardening. I have little puzzle for you. I have rather large patch of raspberries which produce the fruit twice a year. First crop in usual time June/July and another in late September/October. How to prune these beautiful species? They are not two types of raspberries mixed together. Just one kind bearing the fruit twice a year. Ken Answers! I have a similar Raspberry and the variety is Heritage. Heritage are called ever-bearing, which means they bear twice before the cane dies. Normally, a cane of Heritage type will bear at the top of the cane in the fall the first year. Then, you cut off the top portion, and the cane will bear the next spring all along the cane and then die. At this point, you cut the cane off down by the roots. New canes coming from the roots will go through the process of bearing at the top the first season, etc. Vivian Asks? My datura pods are breaking open with their valuable seeds and I am sprinkling them around the gardens of neighbours who want them for next year. I secretly sprinkled them one dark morning in the churchyard near my home. Think I may be in trouble ..........but who cares. What beautiful pure white trumpet flowers!! Ken Answers! Datura does have lovely blooms and gathering the seeds is a good idea otherwise you might find them adding beauty to your gardens where you don't actually want them.